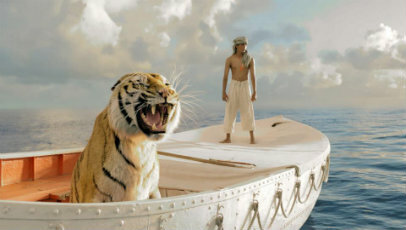 Life of Pi, Yann Martel’s supposedly unfilmable Booker Prize winning novel, is ushered to the big screen by Brokeback Mountain director Ang Lee after nine years in development turmoil. Working from a script by David Magee, Lee’s interpretation retains the novel’s framing structure as an older Pi (Irrfan Khan) is visited by a struggling writer (Rafe Spall) and proceeds to recount his unbelievable story. Piscine Molitor “Pi” Patel (Suraj Sharma) lives in India with his zoo-owning family. His youthful years are explored in a drawn-out opening in which Pi fosters an avid interest in religion, constantly exploring and challenging his beliefs through three separate faiths. But when finances dry up, the family are forced to move to Canada, animals in tow. However, a freak storm causes the ship they’re on to capsize, and Pi finds himself adrift on a lifeboat with only a fearsome Bengal tiger named Richard Parker for company. And so begins Pi’s bid for survival. Magee’s script takes us through the highs and lows of his 227 days between the ships devastation and his eventual discovery of land. It’s a transcendent, life-changing experience, one that forces him not only to confront and discover his true self, but also to contemplate whether or not his commitment to faith and spirituality are enough to see him through his formidable ordeal. It’s a mostly successful approach in its bid to help Pi understand more about the harshness of the natural world and the real power divinity holds. This is no more noticeable than when Pi, left battered and bruised by the forces of nature, finds himself an equal to Richard Parker – two beings who share a common bond through their animalistic urges and a harsh need for survival, yet are wildly different in their appearances. Magee’s script, however, is much too heavy-handed in the way it spoon feeds its religious themes to the audience, and the fact the narrative intermittently returns to the present day forcefully reminds the audience that the film is more of a brazen fable than a survival tale. It’s frustrating, often as if Magee and Lee don’t have the confidence to simply sit back and let the audience ruminate for themselves. When it works though, particularly during its mid-section, Life of Pi is a thing of beauty, with Lee saturating the film in unparalleled cinematic magic. The effects, including the rendering of the animals (it’s hard to imagine such a convincing tiger has been constructed solely from computer generated means), are spectacular and entirely natural, consuming the audience in their majestic beauty. The boat sinking sequence, too, is a triumph in itself. This makes the fact the narrative is too bullish (it’s ending will no doubt leave you questioning everything that’s preceded it) all the more irritating, as Magee constantly throws in conundrums to challenge Pi that also disturb and agitate the audience investment. It’s unnecessary, especially considering that Lee has, for the most part, constructed such a wondrous piece of filmmaking that even the 3D works.